All edits made to this article by new or unregistered users are currently subject to review. See the protection policy and pending changes log for more details. Edits to this article by new and unregistered users will not be visible to readers until they are accepted by a reviewer. To avoid the need for your edits to be reviewed, you may request unprotection, log in, or create an account. 2 Archibald and Robertson were named two of the NBA's 50 Greatest Players in 1996. 3 1970–1972 Cincinnati, 1972–1976 Kansas City. 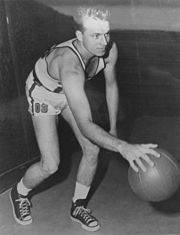 6 1955–1957 Rochester, suffered a career-ending injury in 1957–58, the team's first season in Cincinnati. 8 Stojaković is currently working for the Sacramento Kings as the director of player personnel. 9 Divac is the team's current general manager. 10 1955–1957 in Rochester, 1957–1966 in Cincinnati. 11 1970–1972 in Cincinnati, 1972–1981 in Kansas City. The Sacramento Monarchs' 2005 WNBA season champions banner, as well as the Monarchs 2006 Western Conference champions banner, also hang from the rafters of the Golden 1 Center. 1 In total, Lucas was inducted into the Hall of Fame twice – as player and as a member of the 1960 Olympic team. 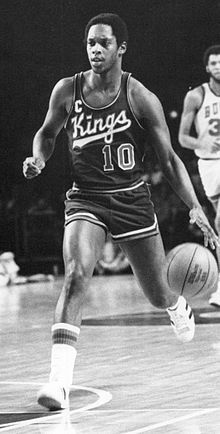 2 In total, Robertson was inducted into the Hall of Fame twice – as player and as a member of the 1960 Olympic team. 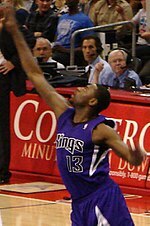 Wikimedia Commons has media related to Sacramento Kings.